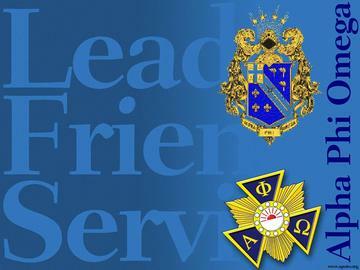 •The purpose of the fraternity shall be to assemble college student in a National Service Fraternity in the fellowship of the principles of ALPHA PHI OMEGA; To develop leadership, to promote friendship and provide service to humanity and to further the freedom that is our national education and intellectual heritage. The rich ALPHA PHI OMEGA is derived from the fellowship of Boy Scouts of America as embodied in the Boy Scout Oath and Law. •We envision to be the leading service organization committed to the development of world class membership that cares for the quality of life with complete complement guided by the three cardinal principles; LEADERSHIP FRIENDSHIP SERVICE………. ALPHA PHI OMEGA is destined to be one of the the greatest fraternities in the world because it has its foundation the highest ideals of the ages. The most perfect standard the generation have been able to produced a standard accepted by all nations, relegions and all people, on which the motivating idea is to look for the good and try to to do good to everyone regardless of who or what belief and furthermore has the practical application in most commendable educational social services.